These easy low carb pumpkin muffins are made with almond butter and require no flour whatsoever. They are also completely dairy free and sugar free, sweetened with some stevia powder. These flourless pumpkin muffins and keto and paleo friendly! I go through a lot of recipe testing in my kitchen and almond flour is one of the most common low carb flours I use. Because of that, I have to buy a few kilograms of bags of it every month. When I thought about making these low carb pumpkin muffins, I had actually run out of almond flour so I decided to use almond butter instead. However, both almond flour and almond butter work for this recipe. Simply measure the same amount of almond flour in weight, and you’ll get the same recipe. 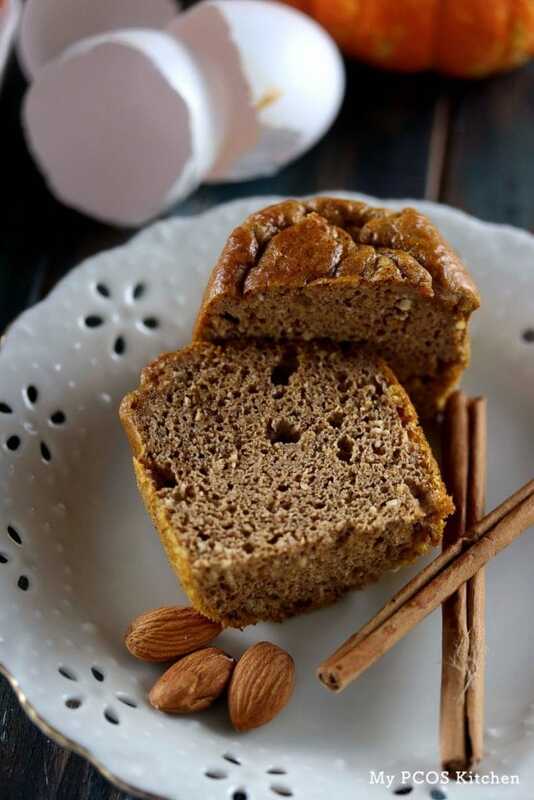 For this gluten free pumpkin muffins recipe, I actually used some of Artisana’s almond butter. I really like using it because it’s very nutty and not as smooth as when I make my own. Obviously creamy almond butter is amazing, but for this recipe, having chunks of nuts in the batter was even more delicious! These keto pumpkin muffins couldn’t be easier to make, as you only need to mix a handful of ingredients together and bake in the oven. How easy is that? I used some cute pumpkin muffin cups, but you could use any type of muffin cups you have on hand. 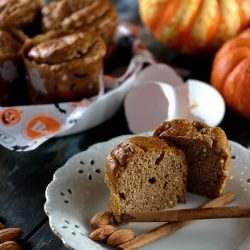 I created these flourless pumpkin muffins after making an individual pumpkin mug cake. The pumpkin mug cake is great for when you just want to have a single treat, but since it fall, I feel like having a pumpkin treat every other day or so. Having these on hand has been life saving! For a totally different muffin idea, you can always make some easy blackberry paleo muffins that are super quick to make! These easy pumpkin muffins don’t require that many steps to make as you only need to mix all of the ingredients together. The best thing about these ketogenic pumpkin muffins is that you don’t need any type of special equipment. 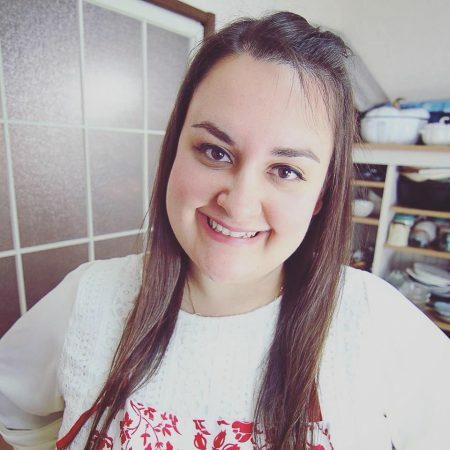 You can either use a whisk, or a hand mixer to mix all of the ingredients together, but that’s it. Nothing else. You can add all of the low carb pumpkin muffin ingredients into a bowl at the same time, and just simply mix everything together. You can also add them one at a time, if you’d like. Both methods work equally well. 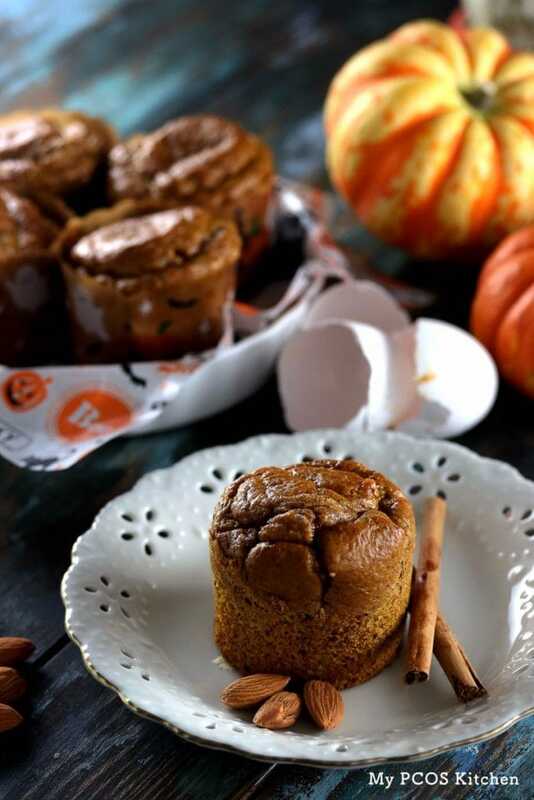 Once all of you’re pumpkin muffin batter has been mixed, simply pour it into 7 muffin cups or muffin molds. In the video showing how to make this pumpkin muffins recipe, I only had 6 muffin cups on hand so my muffins were slightly bigger, and I did need to bake them a couple of extra minutes. The texture was pretty squishy just like the amazing 90 seconds bread. I don’t think it tastes like eggs as I mostly tasted pumpkin and pumpkin spice, but because of the eggs, it was definitely very squishy like I show in the picture below! These flourless pumpkin muffins are made without any flour and with lots of eggs, so you shouldn’t have a thick batter. 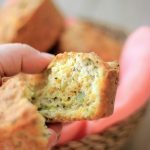 They are very easy to pour into muffin cups, or into muffin molds. You’d be surprised at how many people buy canned pumpkin puree only to find out it’s filled with sugar. Make sure you get some that says 100% unsweetened pumpkin puree. The cans that say pumpkin pie filling are filled with sugar, so be careful! Do you have a nut allergy? Just switch the almond butter for a non-nut butter like sunflower seed butter, and you’ll have some delicious nut free pumpkin muffins. Want to use another nut butter? You can use any other type of nut butter you want. Cashew butter, macadamia butter, hazelnut butter, or peanut butter. The possibilities are endless! 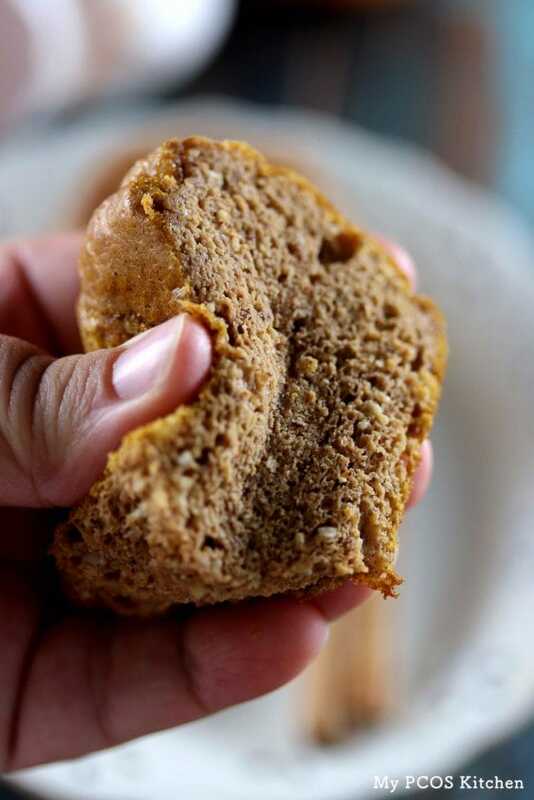 These keto pumpkin muffins stay fresh longer when refrigerated. Make sure you store them in a ziplog bag or a tupperware in the fridge. If you’d like to try more low carb pumpkin recipes this season, check out my low carb pumpkin cheesecake, pumpkin whoopie pies, pumpkin pie and my pumpkin chocolate chip cookies! Delicious low carb and keto pumpkin muffins that can easily be made dairy free and nut free! Preheat the oven to 190C/375F. Mix all of the ingredients in a bowl with a whisk and pour into 7 muffin cups. Place into the oven and bake for 18 minutes. Take out, let cool completely and enjoy! Make sure to use UNSWEETENED pumpkin puree. Pumpkin pie filling is filled with sugar so be careful! You can sub the almond butter for sunflower butter for a nut free muffin! Could I replace one of the eggs with a flax egg as I need more fiber in my diet? Hi Paul! I think you could, but I haven’t tried! Made these yesterday and I’m incredibly pleased with the results. 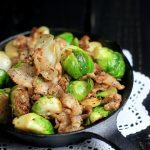 I confess, I was very skeptical that these ingredients would produce good results, but I was very pleasantly surprised! I doubled the recipe and filled TWO 24-cup mini muffin trays. I had plenty to fill them…with just a little left over. I only needed to cook them for 10 minutes in the mini muffin tins. After letting them cool, I DID have difficulty getting them out of the cups, even though I had sprayed the pans with coconut oil (perhaps I needed to spray a bit more generously) and then I had to score around each muffin with a sharp knife to pry them up… but that’s not the fault of the recipe. Can you substitute peanut butter? I cannot find Almond butter at our grocer in Antigua. Hi Sandra, you can use any type of nut butter you want. I mention this in the blog post. 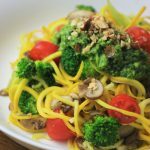 Thanks for this easy and tasty recipe! I’ve made it in regular muffin size, mini muffin bites, and loaf too! All worked great. Being able to slice the loaf and toast it is my favorite. I dropped a teaspoon of cream cheese inside the regular muffins and it was a yummy surprise each time! To substitute almond flour is 1/2 cup correct amount?? I just ran across your site while looking for a new paleo muffin to try that didn’t contain almond or coconut flour. Yum! These were awesome. I didn’t have Stevia on hand so used about between about 1/4 cup honey and 1/4 cup maple syrup mixed together. I could have probably used a little less sweetener and will only use about 1/3 cup of honey/maple syrup mix next time as the spices worked together great to give it a nice taste and balance. But with that said, my toddler ate this batch with gusto! Thanks for the great recipe. I just made this as a loaf. It turned out fantastic! I doubled the recipe and added 1/4 c. of honey, since I don’t have stevia. I was sceptical it would work with almond butter and no flour of any kind. So glad I tried it. The texture is so bread like! Thank you! I made those in small cupcakes! I want to do this, too! How long did you end up baking them when they were smaller? Can you substitute the Stevie with either agave or honey? You can but you’ll have to add much more. Probably from 1/4 cup to 1/2 cup or more. Hmm, I’ve never used the liquid stevia in baked goods. The stevia site says 1 tsp of powder should bee 2-4 drops, but I’d just add a couple of drops and taste test with my finger first and add more as needed. What is the best way to store these? I am currently the only on in my household that will eat these. So I don’t want them to go to waste. I store them in the fridge in a ziploc bag. My mom has stored them in the freezer individually and microwaves them individually still in the ziploc and then toasts them when she wants to eat one. Forgive me, I’m not much of a baker but having switched over to a Ketogenic diet, I am baking my own sweets. My silly question is, should the butter be melted or room temperature? I melted/softened mine so it will mix more evenly. Would you be willing to post the 90 second microwave version? 40g pumpkin puree, 40g almond butter, 1.5 tsp butter, 1 egg, 1/16 tsp stevia, 1/4 tsp baking powder, pinch of cloves, cardamon, ginger, cinnamon. Mix everything and microwave for 120-140 seconds. How much is 40g in US measurements?